Obituary for Marjorie Jean Hedden | Rhoney Funeral Home, Inc.
Marjorie Jean Hedden, of Sanborn, NY, passed away on Sunday, January 27, 2019, at her residence under the care of her family and Niagara Hospice. She was born in Niagara Falls, NY, on July 6, 1928, a daughter of the late Galen Mark and Pauline [Evans] Treichler. Mrs. Hedden graduated from Wilson High School and from Morrisville technical College. She worked at her families business C.F. Treichler Green house over the years. Mrs. Hedden was a charter member of Tri-Community Ambulance and a was member of the Sanborn Historical Society. 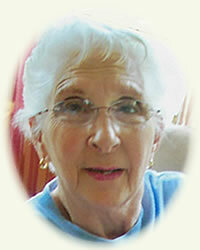 She enjoyed quilting and attending church while living in Virginia. She was the wife of the late Gilbert D. Hedden, who passed away in December of 1997. Mrs. Hedden is survived by her daughter, Suzanne M. Allan, two sons Timothy D. (Linda P.) and Jack E. (Maryann) Hedden, Sr., a brother Galen M. Treichler, six grandchildren, twelve great grandchildren, many nieces, nephews & cousins. She was the sister of the late Joan Zuch. Private Funeral Service were held at the wishes of her family. Memorials may be made to Niagara Hospice. Inurnment in Mt. View Cemetery, Pekin.